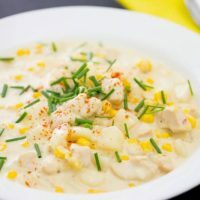 Recipe for Spicy Chicken Corn Chowder is a welcome addition to any table on those chilly nights when your bones need warming. Quick to the table and satisfying. Spicy Chicken Corn ChowderThis is a recipe that Sam and I have been doctoring and tweaking for years. It’s a cheese spicy soup that’s prefect for those nights you want something warm and spicy. Believe it or not, it actually gets cold in Mississippi. Once temperatures dip below 60°, people start pulling out their super thick winter coats and women pull out their ugly ugg boots. You would swear everyone around here is preparing to climb Mt. Everest. Even though I don’t share the low tolerance of Mississippian’s cold weather, I do love a nice bowl of hot Spicy Chicken Corn Chowder on a cool or chilly day. Especially while watching college football. 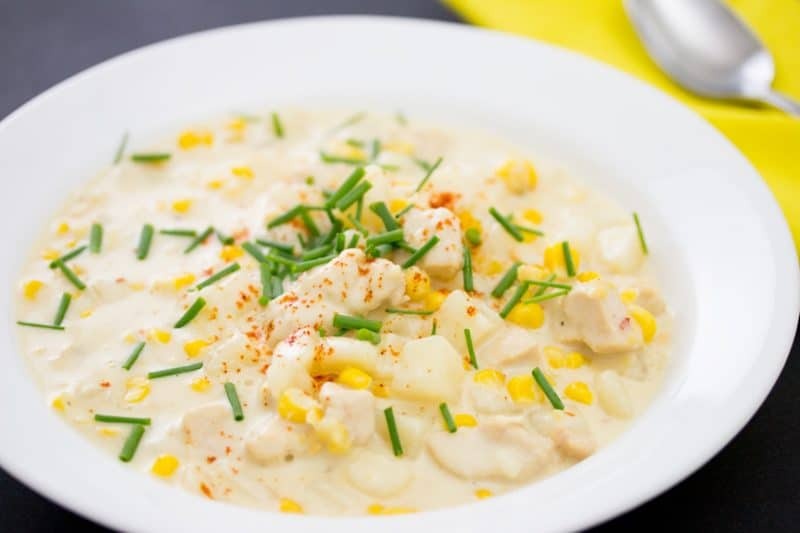 This Spicy Chicken Corn Chowder recipe is super easy and super tasty. It features chicken, corn, and cheese. How can it get any better than that. We have experimented with a variety of cheeses, but our favorite cheeses are what we have listed in the recipe. Also, feel free to omit the cayenne if you don’t want it spicy. Add more if you want it hotter. I typically make the recipe as is and then sprinkle in my cayenne in my own bowl. My wife doesn’t like a super spicy recipe. Anyways, I hope you enjoy the recipe and be sure to give it a go this fall. Hearty, warm, and satisfying Spicy Chicken Corn Chowder is loaded with cheese and flavor. Sure to please the whole family. Heat a medium sized pot (or 5-6 quart dutch oven) over medium heat. Add about a tablespoon of vegetable oil and saute the onions until just starting to turn translucent. Add the chicken and cook until starting to turn brown, then add the cumin. Add 2 to 4 cups of the chicken broth, making sure chicken is covered and cook until the chicken is cooked through. Simmer until all ingredients are heated through. Add the heavy cream and bring to a bare simmer. Add the cheeses a small handful at a time and incorporate each handful before adding more. Add the cayenne if desired and taste for salt. Feel free to use precooked chicken from another recipe for this. It'll make it even faster. You can of course use raw potatoes for this. Just add them when you add the chicken broth and simmer until they are cooked before adding the corn. You may need to add more chicken broth.